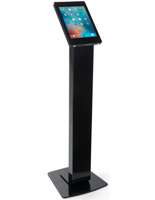 An iPad enclosure stand, like this secure tablet holder, is a portable tool that can be used by many types of businesses in various environments creatively! In order to be revolutionary and keep a business ahead of competitors, companies today are beginning to align marketing strategies to harmonize with emerging technology trends that continue to deeply impact and change the way society operates as a whole. 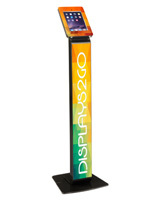 This photo and media gallery stand, iPad enclosure for tradeshow kiosk use is a cutting-edge tool that can be integrated into the design of a booth or exhibit to provide additional information to interested guests! When foot traffic increases and visitors become intrigued in a set-up, representatives of the brand interact with attendees firsthand and communicate important facts so as to sway consumers to choose a company over another. 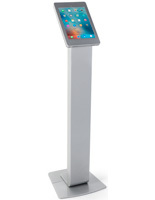 This Apple tablet holster, iPad enclosure stand that is used as a kiosk can be positioned near the entrance of a display to provide another means of conveying information to prospects on a wide span! Even though brand reps may be actively engaged in conversation with visiting customers, those interested can explore the enterprise further on a custom designed application. 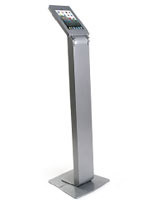 Recording visitor data can also be done by using this stand which will help to start and maintain a relationship with prospects immediately! 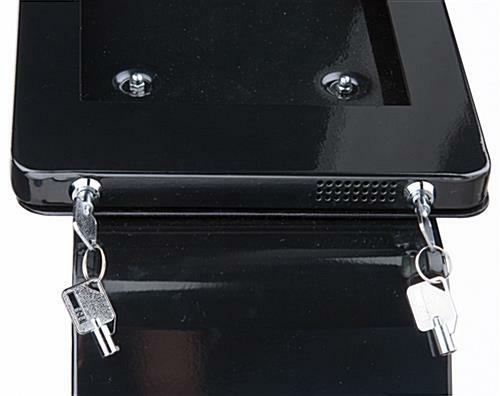 This digital pedestal, iPad enclosure that features two secure locks which will keep expensive electronics locked inside the configuration at all times. The outer electronics casing is crafted from aluminum and provides calculated holes to allow for sounds to be played clearly! The small stylus included in this construction should be only used by management when sound adjustments are necessary or the uppermost power button needs to be used. The meticulously designed encasement also prohibits guests from pressing the home button to explore other unauthorized photo albums or apps. 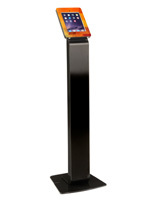 This iPad enclosure stand has a built in power strip which allows users to provide continual battery life during any type of reasonable indoor event! 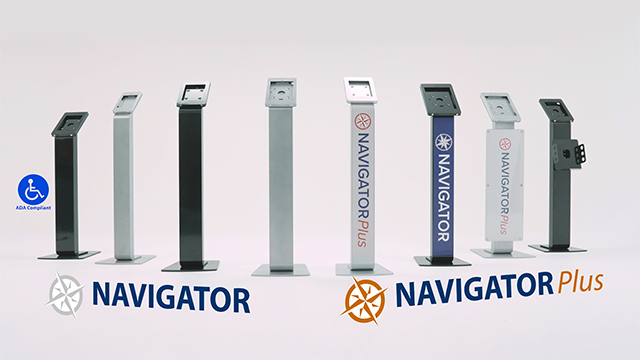 Please note that this system is designed for electronic devices and must be used inside at all times! 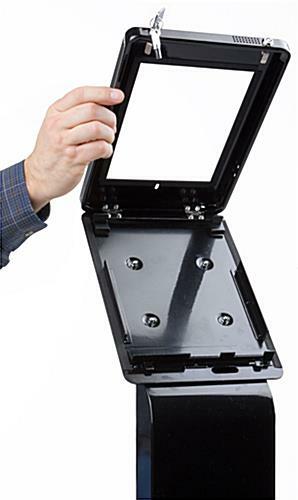 Conversely, this iPad enclosure that safely holds a second generation Apple tablet provides many unique features that other models simply cannot offer! 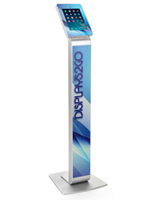 Furthermore, this affordable, versatile design is a must-have for any company, institution, office or gallery! 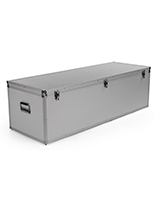 Please Note: This unit accommodates Apple® 2nd, 3rd, 4th generation and iPad Air 1 & 2 designs! An Additional iPad Air Kit is included in the hardware! 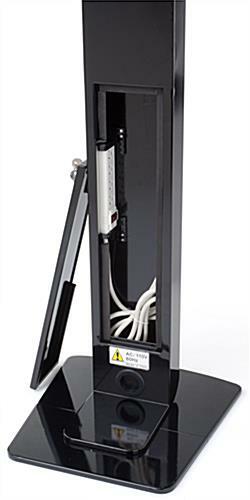 Although this unit holds iPads in portrait or landscape layout, the power cord along with the cable channel will be exposed while situated horizontally. Also, the home button access is covered. Cord management will not be accessible when in landscape orientation. Works OK in Portrait mode, but not at all in Landscape mode, which is how we need to use it. The website description does not explain this correctly. 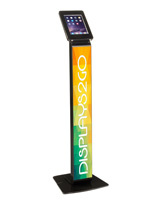 Jose, we apologize that this iPad Stand doesn't work for you in Landscape mode. 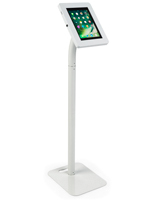 Our website does display this disclaimer: "Although this unit holds iPads in portrait or landscape layout, the power cord along with the cable channel will be exposed while situated horizontally... Cord management will not be accessible when in landscape orientation." We would like the chance to rectify this issue, and we will have a customer care specialist follow-up shortly. Thank you for your feedback! I like the internal power strip. This stand is studier than most stands that I have used. It is very sleek and clean looking. The only flaw are the screws that stick out too far that mount the iPad holder to the stand.